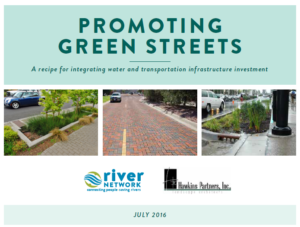 This guide outlines a simple and logical methodology to promote street-based stormwater management that can address the complementary municipal goals of improving water quality and restoring natural hydrology. This methodology is guided by larger cities’ analysis of and commitment to green street strategies. Cities such as Philadelphia, Boston, Chicago and New York have made intentional commitments to green street strategies to reduce stormwater runoff that contributes to combined sewer overflows. Developed by River Network and Hawkins Partners, Inc., this green streets methodology targets mid-sized cities that may not have the same resources as the larger cities that have embraced green streets. It reflects an approach that (a) demonstrates a clear connection between stormwater runoff and the road system, (b) involves neighborhood, utility and local official guidance, and (c) connects green streets to established local priorities.